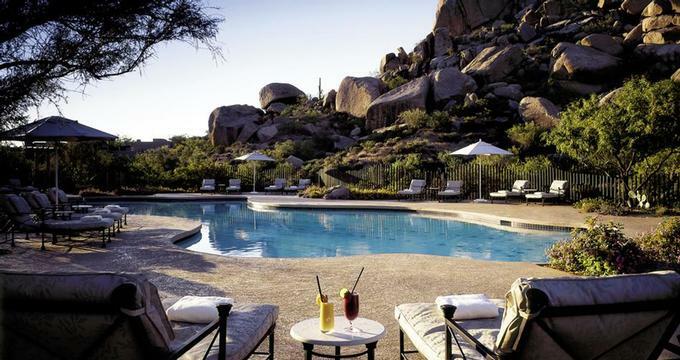 The Boulders, A Waldorf Astoria Resort is spa resort located on 1,300 acres in the Sonoran Desert, near Scottsdale, Arizona. The resort has two 18-hole championship golf courses and the Waldorf Astoria Spa in a unique Sonoran Desert setting. The two challenging courses, designed by Jay Morrish, feature breathtaking desert views and are ideal for a golfers. The architectural beauty of the resort and its Southwestern ambiance blend with the surrounding desert and granite boulder formations. The Spa features a labyrinth, fitness center, movement studio, Vichy treatment rooms, Yoga studio, full-service salon and Cafe. Facilities include four pools and a 90 foot granite and metamorphic rock climbing wall. The resort offers premier tennis courts and a classic clay court. Guests can sign up for private lessons and weekly clinics. A popular tennis activity is The Boulders Challenge held each Saturday in which two resort guests play doubles with two staff professionals and receive instruction throughout the match. Choose from 160 guest casitas and 50 Pueblo Villas, some situated along the golf course. The rooms and villas are decorated in Southwestern style with earth-tone furnishings, glazed tile, Indian artifacts and regional art. Guest room patios or decks offer desert and golf course views. The Palo Verde restaurant serves seafood and regional specialties. If features an exhibition kitchen. Other dining and entertaining options include The Grill Restaurant and Bar, The Boulders Club, The Discovery Lounge and The Bakery Cafe. The resort's location next to huge 12-million-year-old granite boulder formations creates a truly unique setting. Nearby vacation activities include boutique shopping and a Native American museum. The concierge at the The Boulders can arrange other activities such as hot-air ballooning and desert jeep tours. Spring and fall months offer warm weather. The hotel is 33 miles from Phoenix/Sky Harbor Airport and 13 miles from Scottsdale Airport. Transportation can be arranged from Sky Harbor and Scottsdale. Rates from $145 per night. Green fees range from $110 to $220 per round, depending on the season. Browse more golf and spa packages.